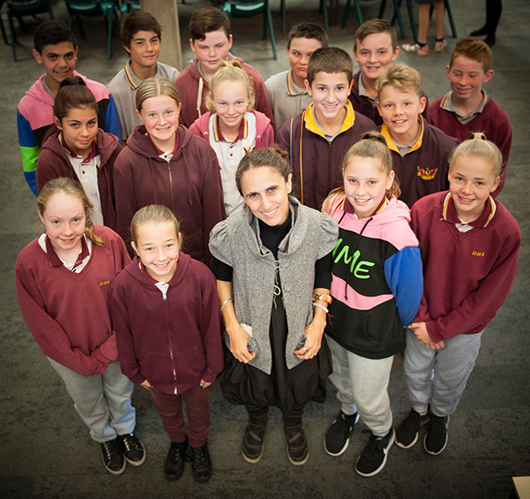 Fifty students at Dapto High School discovered new sides to the familiar stories behind their favourite objects. Exploring the depths of memory and experience, teaching artist Lilly Blue led the students through thought-provoking writing exercises that encouraged them to draw lines between the familiar and the unknown wonders of their poetry objects. Engaging in activities based on the Poetry Object learning resource, students in Years 7 and 8 delved into their own personal reflections, turning their attention to special memories as they uncovered the magic behind their special belongings. Having taught many Poetry Object workshops I am increasingly curious about the personal worlds of experience and memory that can be opened by a single chosen object. During the Dapto workshops one student shared a best player trophy she had won for football and I was impressed by the scope of her exploration from shock, to pride, to joy, to family, to feminism, to disappointment, to empowerment. Each object seems to welcome worlds of remembering and shared experience and ignite a deep opportunity for personal storytelling and reflection. There is a particular magic that happens when a room full of students drop into their own private reflections and this was palpable in the acute silence of endeavour as full classes of Dapto students composed and edited their Poetry Object poems. A particular kind of quiet where the only movement was hands, and pens marking pages with carefully chosen words. I am so grateful to Dapto students for having the focus, courage and commitment to quieten themselves enough to hear their own powerful voices. Lilly Blue is a poet engaged with Red Room Poetic Learning. She is a visual artist and educator with a background in physical performance, installation and community arts. She has worked Internationally delivering arts residencies, professional development programs, creative commissions and exhibitions, as well as designing arts programming for young audiences driven by a rigorous studio practice. Together with dancer Joanna Pollitt she is the Creative Director of BIG Kids Magazine, an Australian contemporary arts publication that features the work of children and artists side by side and promotes the arts as an every day way of seeing and responding to the world.